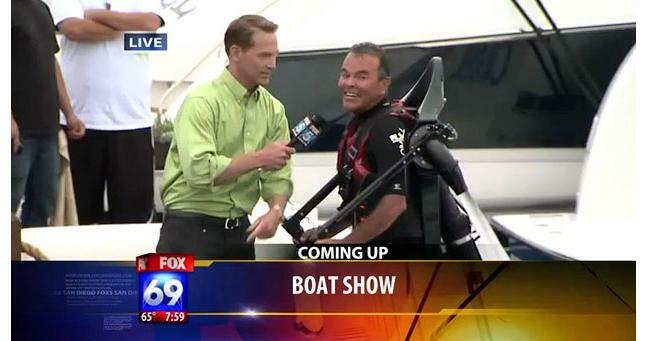 The setting is a Fox 5 San Diego morning newscast featuring this dude on a water-powered jetpack. The good stuff happens at the 0:08 mark when the expected aero-stunt gets off to a lousy start. How lousy? You’ll have to watch it yerself. See the video after the jump. But like all true adventurers, not even a surprise submersion could dampen his spirit. See him soar! The best part for us was when it cued to the studio anchors, who both looked like they could hardly get a word out. Priceless. Aha! If we’re not mistaken, the grinning fail guy is strapped onto a variant of the JetLev that first came to our attention earlier this year.